Minutes after US President Donald Trump ended an inflammatory speech in central Phoenix on Tuesday, police fired tear gas canisters to clear protesters from the city centre. Instead, running battles continued late into the night. By DANEEL KNOETZE. In an unscripted address, Trump defended his response to the white supremacist terror attacks in Charlottesville, Virginia last Saturday and all but pardoned former Maricopa County Sheriff Joe Arpaio of a recent conviction relating to racial profiling in his 16-year long assault on immigrants in Phoenix. Through the day, as Trump visited the Mexican border at Yuma and temperatures topped 43 degrees throughout the state, supporters queued from as early noon outside the Phoenix Convention Centre. Trump is in a slump with some of the lowest approval ratings, at this stage in a presidency, in American history. Yet, he still has the support from a solid third of Americans. As the sense of isolation around him grows, so does the fervour and extremity with which that bloc of supporters rally to his defence. The gun, fitted in a holster emblazoned with skulls and studs, seems to be for show. Yet, if the situation demands it… he’ll shoot to kill, he says. His perception of attacks by anti-fascists (antifa) on white supremacists at Charlottesville in Virginia last Saturday has convinced him that there is a real threat on the bodies of Trump supporters. “The antifa asked me ‘what are you afraid of?’ I ain’t afraid of nothing. I got 54 rounds. Bring ’em on… I don’t want to say that I’m a violent person, but pop one of these in someone’s face and the rest of them will get the message,” he says. Arizona is gun-crazy and an “open carry” state where your taxi driver shows off a photo of his eight-year-old daughter (barely) clutching 12-gauge shotguns to her chest. 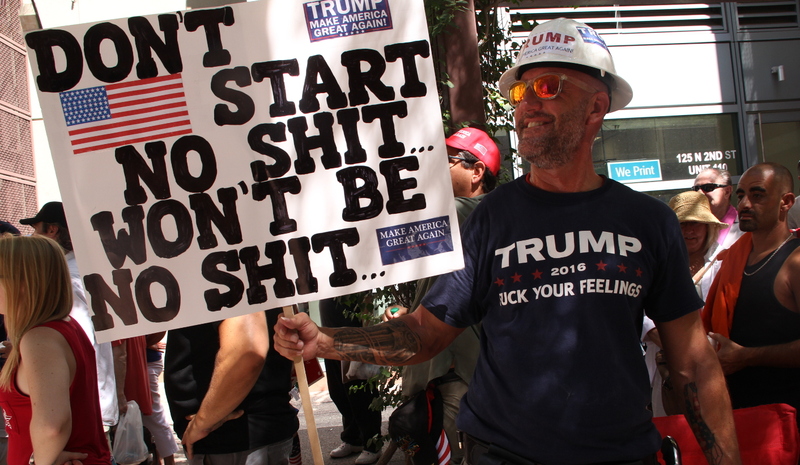 To balance the arms of Trump supporters, anti-fascist demonstrators who, by afternoon, had gathered by the thousands in the area around the Convention Centre employed their own civilian militias. In camo fatigues, members of the John Brown Gun Club patrolled the perimeter with automatic machine guns. They don’t mind being photographed, but do not respond to questions. “I think its important that we organise peacefully,” said anti-Trump protester Robin Williams, 62, from Gilbert Arizona in the midst of all the guns. Tuesday’s rally saw Trump return to Arizona, a state which embraced him in the midst of his transformation into from a wild card candidate into a serious political contender on the campaign trail. A week after that first Arizona rally at the Phoenix Convention Centre on 11 July 2015, Trump surged ahead in the polls of Republican Party’s presidential race. He did so in spite of the controversy of that time: his denigration of Arizona Senator, former Republican presidential candidate and conservative stalwart John McCain. On Monday, amid preparations for a riot and shutdown in central Phoenix and calls from the city’s Mayor for Trump to postpone the rally, an op-ed in the Arizona Republic chastised the state for a supposed moral decay from which many Arizonans’ support for Trump had sprouted. Phoenix, a sprawling city, confines residents to air-conditioned homes, offices, coffee shops and vehicles. On an ordinary day, an eerie abandon stretches from streets of down town into suburbs dotted by sandy expanses and bisected by six lane highways. The social dislocation that undercuts the formation of “stable communities” is a product as much of climate and design, as it is of bigotry. And yet the pervasive inequality of US society cannot but rupture, periodically, into awkward public displays. On the corner of Washington Street and South-Central Avenue a homeless black woman collapses from sunstroke in the heat of an August afternoon than the one of the Trump rally. She lies on the asphalt beneath the glass clad towers of down town Phoenix. Two young, all-American lawmen handle her body like a sack. They douse her in water and command her to walk. Their urgency is spurned by a need for calm and public order – a fixation of the American elite. Similarly, those who inhabit the recently modernised enclave of down town Phoenix seem to long for insulation from the wild, encircling desert. Three generations ago the expanses around Phoenix still crawled with gunslingers, desperados and Indian hordes. Today, in the imagination of many Americans, untamed drug cartels and job-snatching illegal immigrants still lay siege to the valley. In the 21st century, Phoenix has grown exponentially. It has become a city of new arrivals, absorbing large influxes from two diametrically opposite groups: wealthy, white retirees who make second homes in Arizona to escape the blistering winters of American mid-west and north-east; and immigrants who make dangerous desert crossings in a bid to escape unemployment in rural meso-American communities. “These two groups are from very different cultures, with very different languages, food, music, and socio-economic backgrounds. That a culture clash occurs is to be expected,” says Rick Rodriguez, the former editor of the The Sacramento Bee and professor with the South West Borderlands Initiative at Arizona State University. That clash resulted in the sustained success of Sheriff Arpaio, whom Arizonans elected five times as Sheriff of Maricopa county, which contains the wider Phoenix metropolitan area and vast swathes of desert to the south west of the city. Under his tenure, the Sheriff’s department ran a campaign that profiled Latino residents, misidentified legal residents as illegal immigrants, split families, exposed deportees to the unforgiving heat waves at a tented camp near the Mexican border and made unnecessary efforts to humiliate inmates. Trump has expressed his admiration for Arpaio, a fellow proprietor of the debunked “birther” conspiracy theory, and continued the Sheriff’s anti-immigration agenda on the national level with a beefed-up Immigration and Customs Enforcement (ICE) division in the US Department of Homeland Security. Orlando Arenas, a protester and artist from the Human Rights organisation Puente, says he came to Tuesday’s anti-Trump represent his friend, Guatalupe, who was one of the first to be “innocently” deported as a result of ICE sting operations in Phoenix.